Edit: This post is also available in Italian. Thanks Massimiliano Buccioni for the translation. 1. To what period of training do these recommendations apply: the base, competitive or the average of all periods? 2. 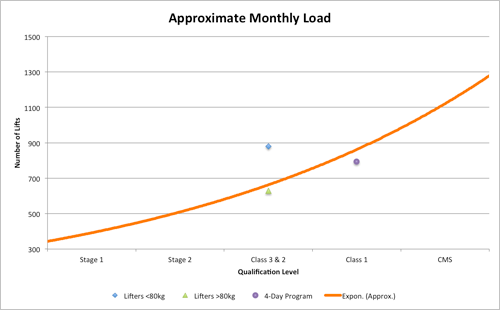 The number of training day these loads should be applied to is not specified. For example, in most cases the MSIC athletes in Russia train 4-5 times per week, MS train 4 times, Class 1 and CMS train 3-4+ times, and the others train 3 times. From this, it follows that the more training days, the easier it is to carry a greater load. 3. It is not known whether the number of lifts includes general developmental exercises, such as hyperextensions, reverse hypers, exercises for the abs, exercises for the pectorals, lats, arm muscles, or leg muscles. And what about incline bench presses, shoulder presses, dumbbell bench presses, etc.? 4. We should also not forget that athletes in lighter weight classes can more easily handle larger loading than athletes in heavier weight categories. Therefore, the programs of athletes in lighter weight classes are planned with larger volumes than athletes in heavier weight categories. 5. Similarly, it is much easier for juniors to handle larger loading than adults and the same relationship applies between adults and veterans. Beginners (1st Month) - 3 training sessions per week. Day 1 - learning how to perform squats. Day 3 - learning how to perform bench presses. Day 5 - learning how to perform deadlifts. Also planned alongside the barbell exercise are 3-4 exercises for the development of general athletic qualities such as power, speed-strength, endurance, and flexibility. Agility is also developed through participation in team sports (football, basketball, volleyball) once or twice per week. The result is 350 - 450 competitive lifts and special preparatory exercises. Great attention is paid to general fitness. Beginners (Months 2-4) – 3 training sessions per week. The result is 450 - 550 competitive lifts and special preparatory exercises at low intensity in the range of 50-60%. The share of general physical exercises still constitute the majority of the volume. Classes 2 & 3 - 3 training sessions per week. The athletes continue pursing technique mastery. Special preparatory exercises are used not only to secure technique, but also to increase the strength qualities of lagging muscle groups. Loading is increased from 600 - 750 competitive lifts and special preparatory exercises. The intensity of loads rises to 60-65% in the preparatory periods. The share of general physical exercise is reduced slightly. Class 1 and CMS - 3-4+ training sessions per week. During training sessions the athletes work on improving the performance of equipment and the development of competitive exercise power qualities through special preparatory exercises. The number of lifts in competitive and special preparatory exercises for 16 workouts per month range from 800 - 1300. Intensity increases to 67-69% in the preparatory periods. The next example is for Andrey Belyaev. The next example is for Alexey Sivokon. See the graphic for a summary. You will see the typical volume progression as well as examples of programs on this site. Notice that special cases such as juniors and lighter weight categories can tolerate above average volumes. Dear reader, please do not take the graph as dogma. It is based on averages and will not apply in every case. You can check your classification here. Excellent. Thank you coach Sheiko! That is a really good article. Thanks coach! In case anyone looks and asks, the three program volumes plotted on the graph are the average volumes. Some months will be higher (prep) and some lower (comp). So I am a level III at 90kgs 177cm tall (need to gain weight). I am lifting 760 per month over a ten week period (on average with a high of 1000 one month) four days a week. This is based on the universal appropriate program. I have added around 15 lifts per month since my previous cycle (mainly to squat since results were not great last cycle). Is there any harm to me doing four days per week rather than the recommended three? I do enjoy being in the gym and am managing to recover it seems due to plenty if available time to rest due to working at home. Why is there such a huge difference between the loading of Andrey Belyaev and Alexey Sivokon? They are both "gifted". He probably also chose these two in particular to illustrate the point he's trying to make. They are both high level athletes and yet there is a big difference in what they need to do to get results. Is there any harm to me doing four days per week rather than the recommended three? A three day program with 1000 lifts is a bit different from a four day with 1000 lifts. In the former case you have greater acute stresses due to the concentration of loading. Since you are a Class III lifter you aren't getting large absolute stresses from the average weight lifted so I think the three day would be better in your case to make up for that. When your classification rises a bit, body weight increases, and you're using heavier weights you can move to the four day with initially less concentrated loading and a bit more technique practice due to the extra day. I will finish this current cycle, since I have a meet in six weeks. I just tested today and had a 66lb deadlift PR so obviously this program is working (albeit probably not optimally). Note this actually puts me fairly close to a class II lifter now. On the other hand you can't beat tangible results. Your idea to just tweak the squat sounds better now than it did before. How about your bench? I only tested deadlift (squat and bench were lifted at 90%), since I am on week 4 and shouldn't have even tested deadlift (except I felt deadlift was ready to go right up). In the last cycle Bench went from a touch and go slow 260lb to a nice fast competition 264lb and almost a 270lb. The touch and go was also not heel down as required in the CPU (IPF). Hard to quantify, but i would say a ~10-15lbs bump in a ten week cycle, which I suspect is good. I am still having upper back tightness issues, but the frequency has been certainly helping me work on this and get a better feel. My leg drive is now way better for sure. I think the real measurement will be the next meet. If I can get 275lbs then I would say that it is working well. You can also try some different special exercises if you haven't already considered that. with the famous coach standing right behind him. The difference in volume is nevertheless huge and would hence also need to come down to the two lifters responding quite differently to large training volumes, again making the point that the individual differences can be quite significant in some cases (Sivokon has been referenced to as performing massive lifting “marathons” in the bench press). The Sivokon/Belyaev volume difference is most surely not representative of the general case though, especially at less qualified levels of lifters, as can be glanced by the not so big volume difference for the three-times-a-week-program for the light/heavy lifter depicted in the original graph. The Sivokon/Belyaev volume difference is most surely not representative of the general case though, especially at less qualified levels of lifters, as can be glanced by the not so big volume difference for the three-times-a-week-program for the light/heavy lifter depicted in the original graph. I agree. Nice first post by the way. Thank you, yes I have already tweaked some squat rep schemes as you just described in an effort to add a little more volume to the program. I will see how this works.